Airbus Helicopters’ Skyways unmanned air vehicle successfully completed its first flight demonstration at the National University of Singapore (NUS). The drone took off from its dedicated maintenance centre and landed on the roof of a specially designed parcel station where a parcel was automatically loaded via a robotic arm. Once successfully loaded with the parcel, the Skyways drone took off again and returned to land, demonstrating its automatic unloading capability. This inaugural flight demonstration follows the launch of the experimental project with the Civil Aviation Authority of Singapore (CAAS) in February 2016 to develop an urban unmanned air system to address the safety, efficiency, and sustainability of the air delivery business in cities such as Singapore. The collaboration was subsequently extended in April 2017 with Singapore Post (SingPost) becoming the local logistics partner to the project. “The Skyways project is an important innovation for the aviation industry. CAAS has been working closely with Airbus on the project, with an emphasis on co-developing systems and rules to ensure that such aircraft can operate in an urban environment safely and optimally. For Singapore, this project will help to develop innovative rules to support the development of the unmanned aircraft industry in Singapore. 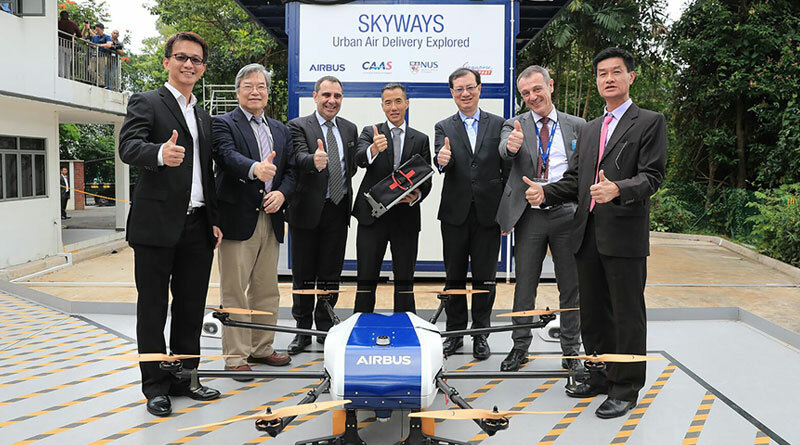 We are pleased with the good progress that Skyways is making and look forward to deepening our partnership with Airbus,” said Director-General, CAAS, Kevin Shum.